Somewhere, I got a little bit behind. And then somehow…I skipped a week. I did take notes and pictures, but I never got them developed or the layouts planned. Lots going on – Valentine’s Day, sick kids and wedding dress shopping with my brother’s fiancee (hence the white blocks). Lots of lovey dovey stuff, so I went with lots of pink in the color scheme. Added in a favorite text from the week using one of Cathy Zielske’s free templates. And a shopping list. Both part of the story of us this year. And the second page. Lots of dress shopping pictures. 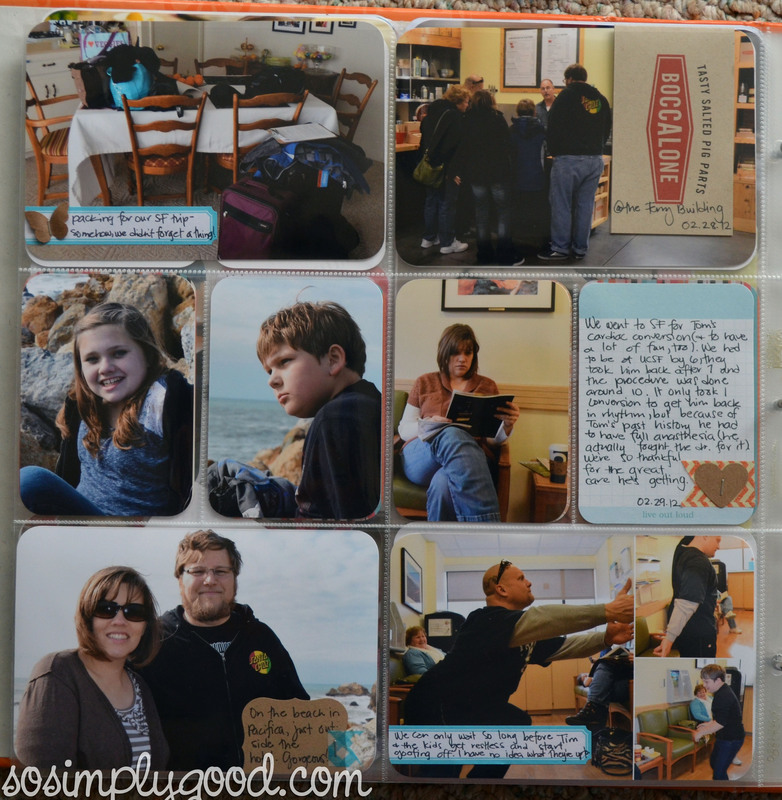 I wanted to include lots of pictures, so I cropped them to 2.75×4″ and stuck them in the 4×6″ pockets. 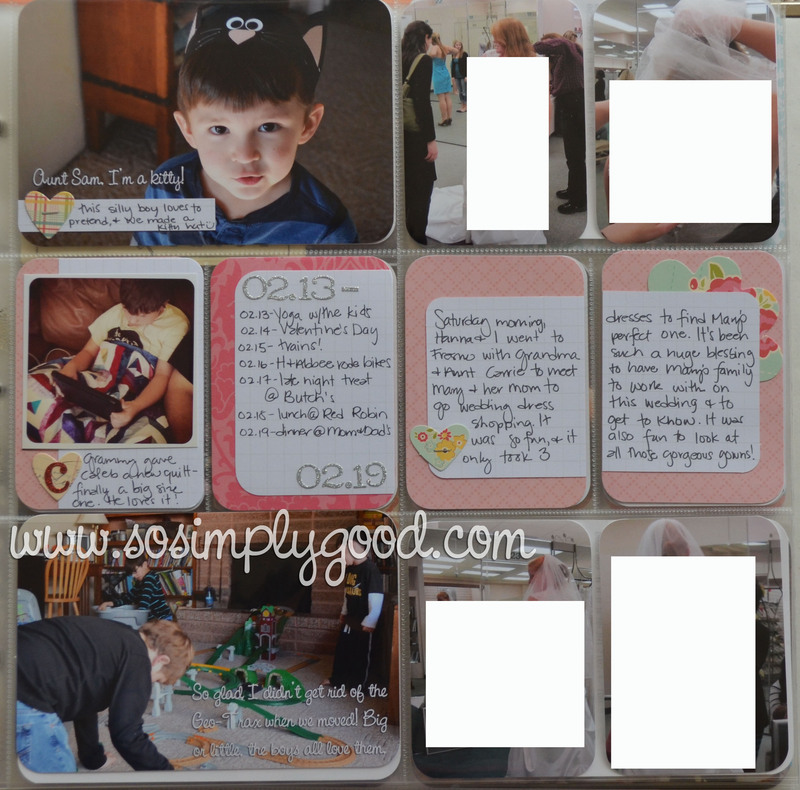 Once I get week 8 done, I’ll very lightly tack them to the back of whatever photos go in the other side. I’m noticing it’s just too hard for me to triage out so many photos of big things, and I’ve decided to stop fighting it. I’ve got a whole year to capture the mundane stuff. If I want to give more space to birthdays and special occassions, I’m going to do it…. which is why most of week 9 focuses on 3 days. Mini vacation to San Francisco so hubby could have a procedure at UCSF. A lot happened and it was all worth recording. 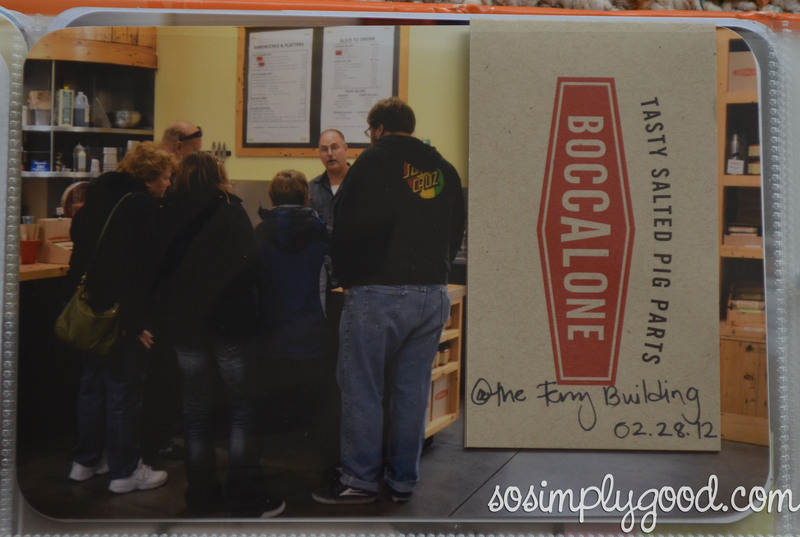 I made a point to snag as many business cards and flyers as I could – this one from Boccalone was a perfect addition. It’s actually a folded one, so I just flopped it over the photo, tacked a little adhesive on the back and jotted where and when on the front. I used other business cards to show off places. That’s my brother-in-law with a crab shell on his head. And, oddly enough, that isn’t anywhere near the craziest thing he did on the trip. I did end up needing an insert, since my nephew’s birthday also fell during this week. 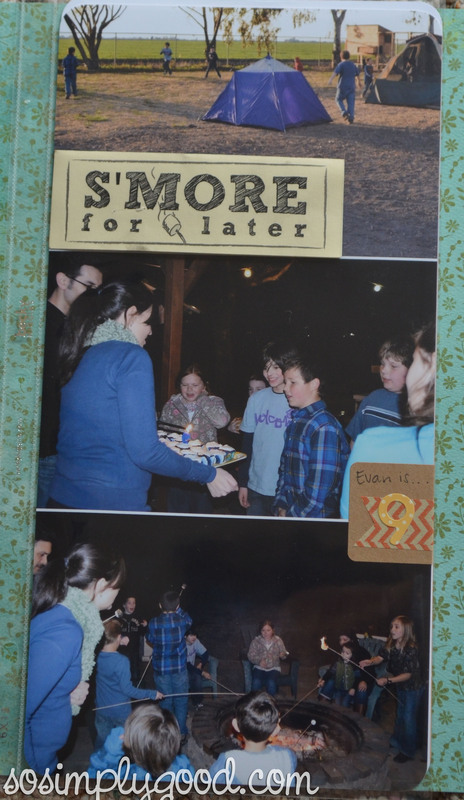 I threw together the photos in a 6×12″ collage in Photoshop and then added a bit of embellishments – the S’more for Later topper was designed by my brother-in-law and was part of the favors. 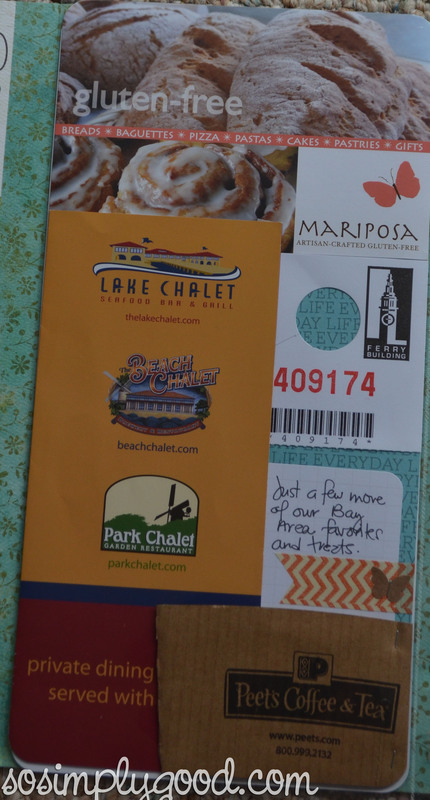 I also wanted somewhere to stash all of the extra flyers and cards I’d picked up on our trip, and the back of the insert worked perfectly. I just trimmed a piece of white cardstock to 6×12 and collaged it together. What’s Project Life? 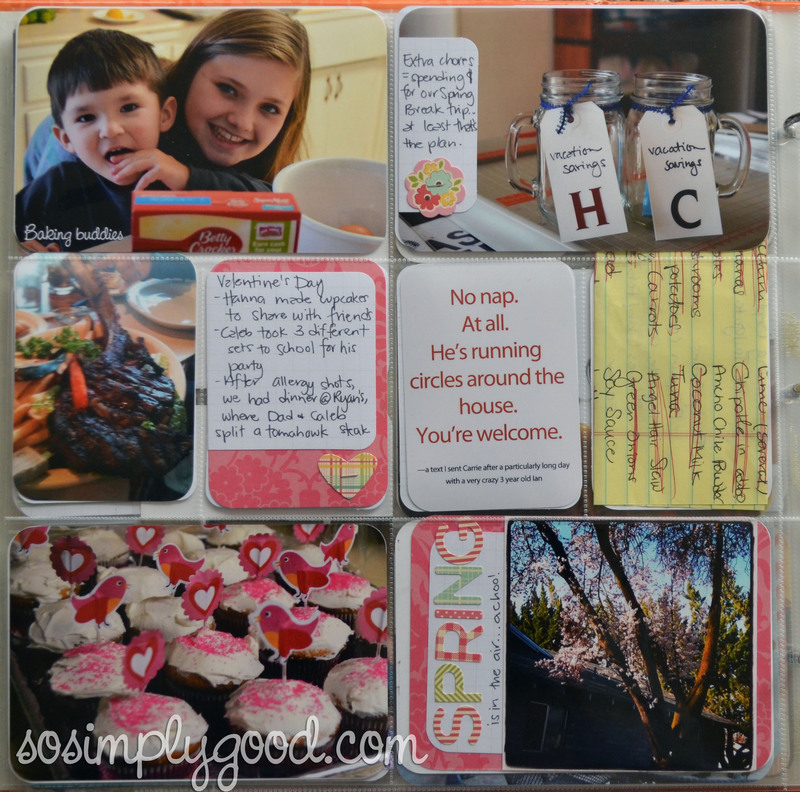 It’s a scrapbooking system created by Becky Higgins to simplify memory keeping. Quite simply, it’s awesome. All of my Project Life posts can be viewed here. 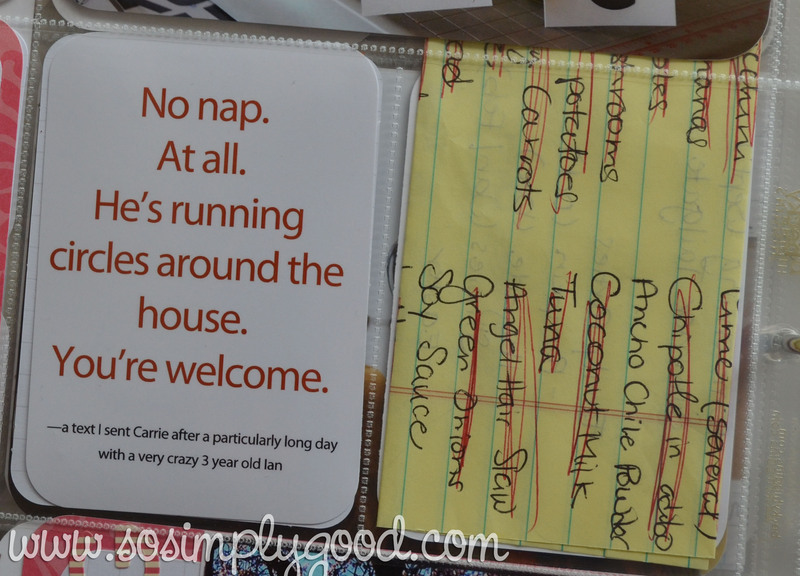 This entry was posted in Project Life by Awkward Girl Gets Fit. Bookmark the permalink.